365 Days of Saudi Coalition Aggression but Yemen is Steadfastly Resisting. 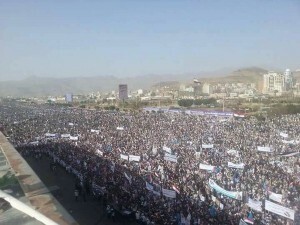 Hundreds of thousands of protesters flooded the streets of Yemen’s capital, Sanaa, to protest one year of Saudi coalition bombardment of the Yemeni people. Despite the threat of Saudi jets hovering in the skies above them, the people of Yemen demonstrated their resistance and resilience, their determination to secure their right to decide their own future and to defend their national sovereignty. They chanted their defiance at the infuriated Saudi war-planes who were witnessing the heart of the revolution against the largest absolute monarchy in the world. The Saudi despotic regime has perceived Yemen to be their fiefdom for decades and is attempting to violently silence their legitimate voice demanding freedom from Saudi colonialism and corruption. These protests signalled to the Saudi coalition that it is the people of Yemen who have ultimate legitimacy. 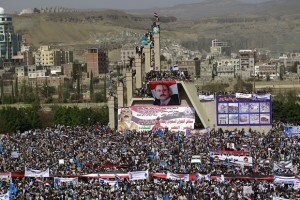 In this first photo, thousands gather next to the Monument of the Unknown Soldier in Sanaa. Huge posters displaying images of former president Ali Abdullah Saleh challenged the circling Saudi fighter jets. Photograph AFP/Mohammed Huwais. Protestors gathered at Saba’een Square, Sanaa to denounce Saudi aggression that has left over 9000 dead, one third of them, children. The following is a short piece written by one young 17 year old Yemeni girl, Fatima Noman, who epitomizes Yemen’s unbroken spirit and refusal to bow down to the Saudi coalition illegal war of aggression. “Tell me how did you spend the last 365 days? Did you end up getting that job offer? Did you get that scholarship you were working so hard to get? Did you graduate high school/university or perhaps you just got your pHD! Whatever you achieved I congratulate you! Well I’d like to speak of my 365 days. You know how we always chant the phrase day by day it all seems the same but looking back it’s so different. I aged a life time within 365 days. I have experienced so much from fleeing my home to running down a set of 70 stairs in fear of a jet blowing up our third floor. Crying for nights and nights feeling death encircling me to laughing to the sound of explosions. Yes, I have lived some of the worst days of my life but I wouldn’t change them for the world. 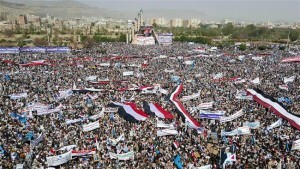 Only now have I realized what an enormous amount of pride comes with being Yemeni. I am now in my senior year and I have broke down into fits of tears more times than I can count in school due to the sudden air raids but my friends support me with a jolt of strength I’ve never experienced before. This year everything is so different. Once I was crying in class from a mix of fear and stress then suddenly the whole class surrounded me with a group hug and I don’t remember feeling so loved in my entire life. This coalition has done and is still doing damage that seems irreparable at time but one thing that no one but them has managed to do is unite this country into one. I feel so complete. Now I know I am capable of facing anything life throws at me, I know I am strong enough. I will always have a constant reminder of my strength the blood of the martyrs who sacrificed everything for me to be able to live a life, a life worth living. It’s truly quite peculiar how even though death has the key to my back door I sleep safe and sound. I still do get grounded and I still am clumsy you’d think death would make me a bit more graceful but nope! I still am the same girl who runs around tables and makes weird faces at my mom to make her laugh cause oh boy does her laugh make me feel five again. 365 days are enough to change people’s perspectives, their ideologies. 365 days of undeniable strength, of determination. March 28, 2016 in Yemen.